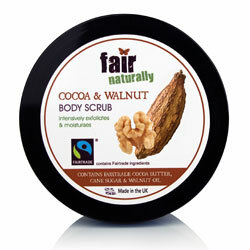 The fair naturally Cocoa range is made with Fairtrade Cocoa Butter, Walnut Oil and Cane Sugar, which are known for their deep moisturising qualities and ability to re-hydrate skin. This luxurious butter leaves your skin feeling irresistibly soft, smooth and nourished. Cream, exfoliate with our nourishing Body Scrub and finish with fair naturally indulgent moisturising Body Butter. 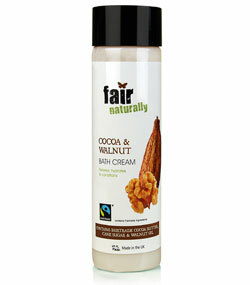 "I love fair naturally's Cocoa range. The products smell good enough to eat!" 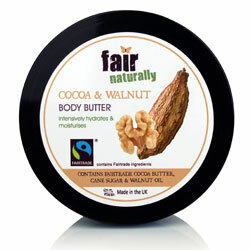 "Best fairtrade body butter on the market. I got a free sample last week and have used it every day since!" This indulgent Cocoa & Walnut body scrub deeply exfoliates the skin whilst our Fairtrade Cocoa Butter and Walnut Oil help to soothe, condition and moisturise. Made with Fairtrade Cocoa Butter, Cane Sugar and Walnut Oil, this luxurious body scrub will help to leave skin moisturised and exfoliated. Relax and unwind with our indulgent Cocoa & Walnut Bath Cream, made with Fairtrade Cocoa Butter, Walnut Oil and Cane Sugar, which are known for their deep soothing, conditioning and moisturising properties. Pour under warm running water to create bubbles and release the aroma of Cocoa & Walnut. Why not indulge yourself by following our fair naturally pampering regime; cleanse skin with this fair naturally Bath Cream, exfoliate with our nourishing Body Scrub and finish with fair naturally indulgent moisturising Body Butter.